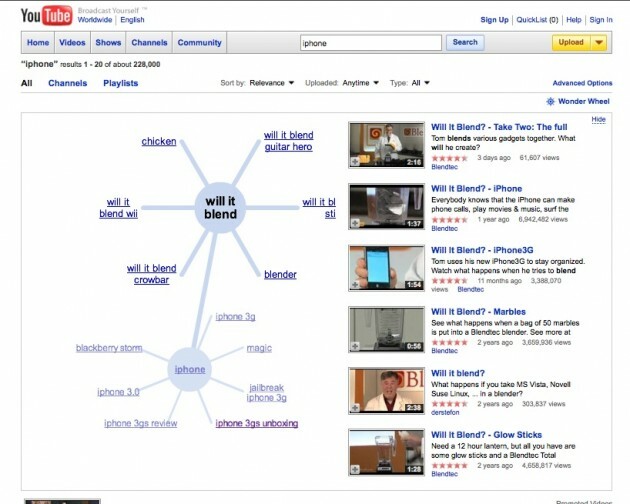 YouTube search now has its own Wonder Wheel. The Wonder Wheel is a visual navigation tool which Google first rolled out on its main search page a month ago when it added some new search options to filter results in different ways. If you do a search on YouTube, which on its own would be the second largest search engine in the world, you will see a new option under the search box on the right called Wonder Wheel. If you click on that, your search term appears in a circle with lines branching out to related tags. Anytime you click on a related tag around the wheel, it creates a new wheel attached to the original with its own set of related searches. YouTube has also added some new features to its advanced search option, including the ability to search by video duration, location, and when it was uploaded. You can also search by category, keyword, video type, and for HD videos only, but those aren’t new.